sharing our knowledge and experiences of growing pulmonarias. Each year we aim to hold a Pulmonaria Day, which incorporates our AGM. This usually takes place in April. The venue changes each year in order to try and cater for members from most parts of the UK. 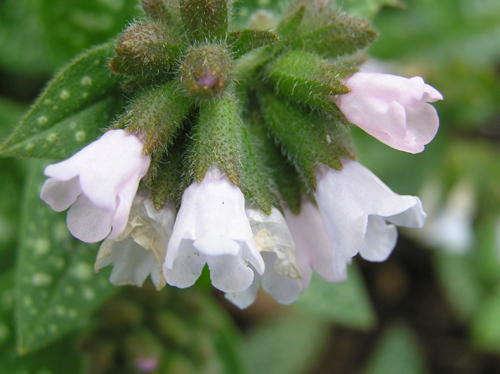 Whenever possible, we try to invite members from the local HPS Group of the area to participate in our Pulmonaria Days. Pulmonaria Day 2019 will be held on 23rd March 2019 at Powick Village hall , near Worcester. The Programme will follow the usual format, with the AGM followed by a talk by Margaret Stone on The Pulmonarias in her garden. Margaret is currently writing the updated version of the HPS Pulmonaria booklet, so I am sure that she will have some interesting things to say. There will also be Nursery and members’ plant stalls giving the opportunity to buy some unusual Pulmonarias at bargain prices. In the afternoon we will visit the garden and Nursery of Margaret Stone and hopefully summer 2018’s dry weather will have not killed off her Pulmonarias. In addition, as the Pulmonaria Group is registered with the Hardy Plant Society, our members are required to belong to the national HPS. UK Members pay their subscriptions directly to the Group’s Membership Secretary. Overseas members send their group subs together with their national subs to the HPS Administrator. Members receive two copies of the Group Newsletter per year - one in the spring and one in the autumn. We usually ask for contributions towards the cost of our Pulmonaria Days and group members are given reduced rates. NB: Your membership details will be filed on computer and kept as hand-written records solely for the administration purposes of the Group. If you object to this please contact the Hon. Secretary.